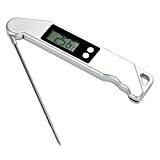 【Accurate Temperature】- LCD display gives you accurate temperature results in 4 seconds. 【Extra Long Probe】- With a total length of 14.5cm, the probe is designed for ease of use, keeping your hands away from the meat when cooking at the grill or in the oven. Foldable design to avoid meat under- & over-cooked. 【Wide Temperature Range】- The extensive temperature ranges from -10ºC to 200ºC, perfect for your grill barbecue or turkey fryer, using hot oil for deep fry, making cheese and bread. Switchable between °C and °F. 【Multiple Uses】- Perfect for both professional and home chefs such as meat, grilling, frying, baking, barbecuing as well as brewing, liquids. The MEMTEQ Food Thermometer incorporates a large digital display with a precise read-out of temperature over the range of -10 to 200 °C with a 0.1 °C resolution and an accuracy of ±0.4 °C. The resolution can be switched to 1 °C. The thermometer is easy to use. All you have to do is insert the thermometer into the meat (avoiding bones), and the LCD display shows accurate temperature results in seconds. Then after you remove the probe, turn it off with the on/off button and rinse with hot water. Do not immerse the entire thing in water as it will have a short circuit. There’s no guessing when the stable temperature is reached; simply turn the thermometer on, insert the tip of the probe into the thickest point of the meat, press the button, and wait for the beep. The thermometer can then be removed and the resulting temperature is held on the display. This top-of-the-line cooking gadget has a 5.8″ stainless steel probe that extends to a total length of 11.5″, thus keeping your hands away from the heat when cooking at the grill or in the oven. Convenient foldable probe design folds away easily and locks into base when not in use for portability and storage. The battery (CR2032 Button Cell Batteries) is not included.